Planet Drum Foundation purchased land outside the city of Bahia de Caraquez, Ecuador to expand the Bioregional Education Projects to include adults and college students. In 2010 Peter Berg wrote A School to Retrieve the Future, an essay describing the newly initiated BSI—the vision behind the Institute and it's curriculum. The Bioregional Sustainability Institute (BSI) is sponsored by Planet Drum Foundation (PDF) in Bahía de Caráquez, Ecuador to teach a bioregional approach for achieving sustainability. BSI courses incorporate aspects of PDF’s ongoing ecological projects that have been developed for over a decade in grass-roots ecosystem restoration. The Institute was created to use PDF’s 150 acres of semi-wild Dry Tropical Forest outside of town for individualized field projects relating to sustainability. BSI classes provide unique opportunities for gaining insight into ways that individuals and communities can live in a high degree of harmony with urban and rural life-places. The BSI program is ideal for students desiring to learn practical, hands-on approaches to carrying out sustainability based on the natural characteristics of a particular bioregion. Courses are available as Three or Six Month Programs. Students in the Three Month Program participate in all of the above activities and assist in developing new sustainability features. Graduates are awarded an ‘Introduction to Bioregional Sustainability’ certificate. Six Month Program students also design and carry out individual projects based on their own interests that are approved and supervised by BSI staff. Graduates are awarded a ‘Mastery of Bioregional Sustainability’ certificate. All graduates will be able to immediately adapt what they learn for future employment in whatever part of the planet they find themselves. 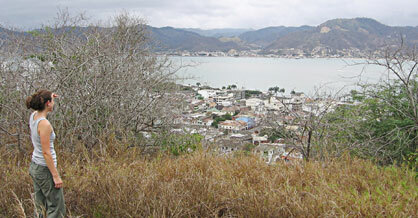 View from above Bahía de Caráquez with Río Chone estuary in the distance. BSI land and the Pajonal region with areas of intact and deforested Dry Tropical Forest. 1. Restoring natural systems. PDF has extensive experience through its Revegetation Project, which involves planting native Dry Tropical Forest trees to mitigate erosion and recreate native animal habitat. The Foundation maintains a large greenhouse for growing trees from seed-to-sapling, designs sites, plants saplings, maintains them for a year, and researches growth and survival rates and successful combinations of species. 2. Developing sustainable ways to satisfy basic human needs including food (garden and farm permaculture), potable water, renewable energy facilities, revegetation with native species, ecologically constructed buildings, and other features. 3. Bioregional Education for local junior high school students featuring both class studies and field trips has been underway for over five years using Bioregionalismo, a textbook developed by PDF. The program teaches youth about bioregional features of their city and surrounding ecosystems and they can actively improve its environment. 4. Community involvement is achieved through a broad range of means including radio and print media, neighborhood meetings, City Council and Mayor's Office, and sharing projects with other groups. 5. Place-located Culture includes exposure to both contemporary Ecuadorian customs and the 7,000 years-old ancient civilization of the region. Beginning or Advanced Spanish Language studies are aimed toward communicating about sustainability activities. Classes are held daily on weekdays, and progress is monitored by supervising educational staff. Each week's schedule will include hands-on learning, field visits, readings, and activities that fit each participant's interest. Accommodations, meals, and local travel are provided. The Three Month Program fee is $5,000 and the Six Month Program fee is $7,000. Enquire about discounts based on budget accommodation, optional Spanish language lessons, and scholarship opportunities. Register now for either a Three or Six Month Program to begin on a date that is convenient for you at any time between July and November, 2011.